IMAGOS Entertainment LLC of Miami FL shared these photos of their recent installation at the Western North Carolina Nature Center “Otter Falls” exhibit. 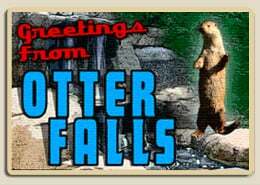 The equipment was installed at the Nature Center’s “Brandon’s Otter Falls” river otter habitat. IMAGOS worked with the Center’s Exhibit Coordinator to install the Technomad Turnkey rPA 70v-Volt System which included 6 Technomad Vernal 15T speakers. The system provides music and PA assistance to the Animal Keepers during their otter feeding and enrichment presentations. Click here for more info on the mind-meltingly cute North American River Otter. You can see Technomad Vernal 16T loudspeakers in the photos, but what you don’t see is the rest of the rPA system we delivered. This quick-to-deploy 70-volt PA package includes amplification, a multi-channel mixer, wallmounts, and cabling. The Vernal weatherproof loudspeaker is unique among ultra compact loudspeaker both in its rugged weatherproof construction, but also its compression-driver loaded high frequency section. The latter means that the Vernal can handle live mic inputs without strain, and deliver crisp, articulate speech even in noisy environments that ‘consumer grade’ compact loudspeakers can’t match. But technical audio details… See the adorable otter video below!